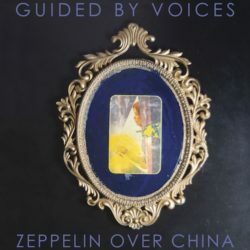 Zeppelin Over China is a major and majestic work in the GBV canon, spotlighting the scope and genius of Robert Pollard’s songwriting. With thirty-two songs in 75 minutes, the massive double-album Zeppelin reaches lofty heights on its musical journey. Pollard continues to deliver endless invention and emotional wallop in two and three-minute guitar rock gems. Pollard has assembled his greatest supporting cast ever—Doug Gillard (guitar), Kevin March (drums), Mark Shue (bass), Bobby Bare Jr. (guitar) and Travis Harrison (engineer)—and this line-up’s virtuosic talents spur him to his most ambitious work yet, a grand album of emotional resonance and narrative drama. After well-deserved acclaim for the mind-boggling milestone of Pollard’s 100 career albums, Zeppelin Over China is a wonderful entry point for new listeners to experience Guided By Voices for the first time. Not resting on his laurels, Pollard’s tireless tenacity pays off with spectacular results.